The 18th century Genevan philosopher, writer and composer, Jean-Jacques Rousseau, in his classic treatise The Social Contract, stated “Man is born free, and everywhere he is in chains.” While the word ‘man’ in Rousseau’s famous quotation refers of course to human beings of both genders, what is more true today is that women are born free but everywhere they are in chains. Chains of social prejudices, gender discrimination and feudal mindsets still allow for exploitation of women to varying degree all over the world. Consider these facts: women today constitute about half of the world’s population, but perform two-thirds or 66 percent of the world’s work, and produce 50 percent of the food, while earning only 10 percent of the income, and owning less than 1 percent of the world?s property. These are worrying statistics that starkly highlight what are both a great social injustice and an equally great deterrent for economic growth and for societal progress. Common sense dictates that empowering women, or about half of the total population of a country, can only lead to greater productivity, and hence to a better quality of life for society as a whole. However this simple logic apparently escapes planners and decision-makers, especially in developing countries, which continue to exhibit a stubborn adherence to a conservative thought-process that regards women effectively as second-class citizens. Fortunately there are forces working hard to bring about the paradigm change that is required. The task is Gargantuan given ages-old beliefs and practices. But a solid start has been made and the initial results are quite promising. The emancipation of women is best achieved through providing them access to education at an early age, and through empowering them financially when girls are old enough to earn livelihood by themselves. Financial empowerment is particularly significant for women from less privileged background and microfinance is a most effective medium to achieve this. The impact of microfinance as a promoter of financial inclusion and of empowerment is best understood by a review of a case in point. Kashf Foundation is a microfinance provider that targets women from low income communities. It has a successful track record of several years, of providing quality and cost-effective microfinance services to women, leading to enhancement of their economic role and decision-making capacity. Recognizing Kashf’s efforts, The Coca-Cola Foundation (the primary international philanthropic arm of The Coca-Cola Company, founded in 1984 as a registered 501(c)(3) charitable organization) decided to extend a substantial grant to Kashf, for a women empowerment through microfinance programme extending over several years. The on-going Coca-Cola and Kashf collaboration has become a hallmark in terms of providing continuing support to women entrepreneurs from low-income households. Through Coca-Cola’s support, Kashf has been able to provide microfinance loans to over 1,150 women entrepreneurs for business expansion. Since the grant is a sustainable investment, this fund will continue to help women entrepreneurs in the future, and according to projections, over 2,600 women will have been supported by 2016. Having an on-going presence in the community, provides Kashf the access to thousands of female entrepreneurs that are interested in setting up new businesses and expanding already existing ones. In this collaboration, The Coca-Cola Foundation will be directly contributing to Tier 1 and Tier 2 entrepreneurs: providing micro-credit to first time beneficiaries to set up businesses and twinning micro-credit with trainings for facilitating returning entrepreneurs to develop their businesses further. The route to becoming a small/medium entrepreneur from a home-based (self employed) entrepreneur is a continuum of many stages. Tier 1 entrepreneurs are first-time borrowers, just starting their businesses; primarily occupied with making their business run profitably. At the second tier, clients have more exposure and experience in running their businesses and are looking to expand the scope of these. With additional support, including capacity building trainings like improving business management skills, these entrepreneurs can graduate into the third tier. 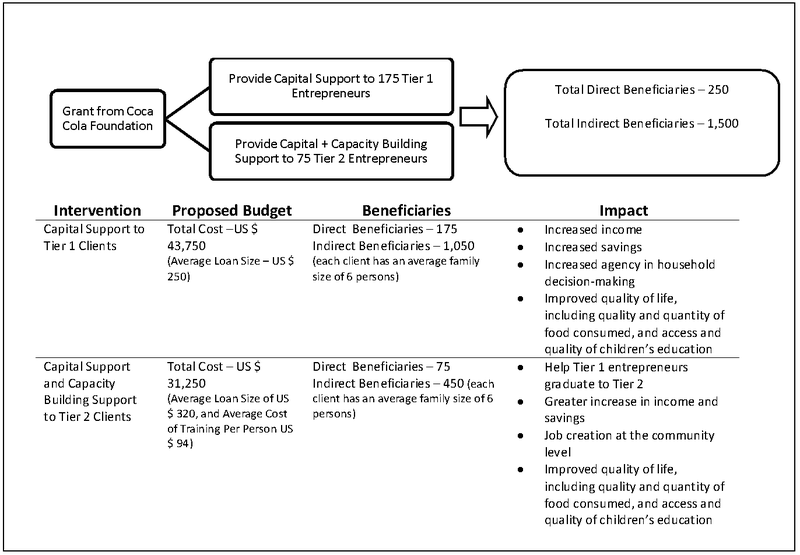 The proposed intervention seeks to improve graduation from Tier 1 to Tier 2 for low-income female entrepreneurs. The training and development will be delivered through a specially compiled programme covering key topics for nascent business managers, including Business Planning & Goal-setting, Budgeting & Financial Planning, Addressing Environmental Challenges, Marketing Techniques, and Business Innovation (i.e. Product, Manufacturing, Marketing, Supply Chain and Management Innovation). All Tier 2 entrepreneurs supported will be beneficiaries from grant support undertaken by Coca-Cola for Kashf Foundation in 2012-2013. From Coca-Cola’s point of view, the collaboration with Kashf is an important CSR intervention, which seeks to strengthen the communities the company operates within. It is an act that has no direct commercial objective, but which finely reflects the Company’s philosophy of how business should be conducted, by giving back to society in a way that promotes sustainable societal development. From the country’s and society’s point of view, women empowerment in this manner has far-reaching and long-term positive impact. A recent research undertaken by Kashf Foundation has revealed that over 85 percent female participants have been able to increase monthly incomes, on average Rs 1,000.00 per month. Various other independent studies have revealed that financially independent women tend to spend more of their earnings on their children’s education and on family healthcare for example, thus directly contributing to wider socio-economic growth and development. As more and more women become empowered, the benefits to society and to the larger economy will become even more evident, and the country can look forward to a much brighter future for all. « THE SUSTAINABILITY GENERATION – The Politics of Change and Why Personal Accountability is Essential Now!